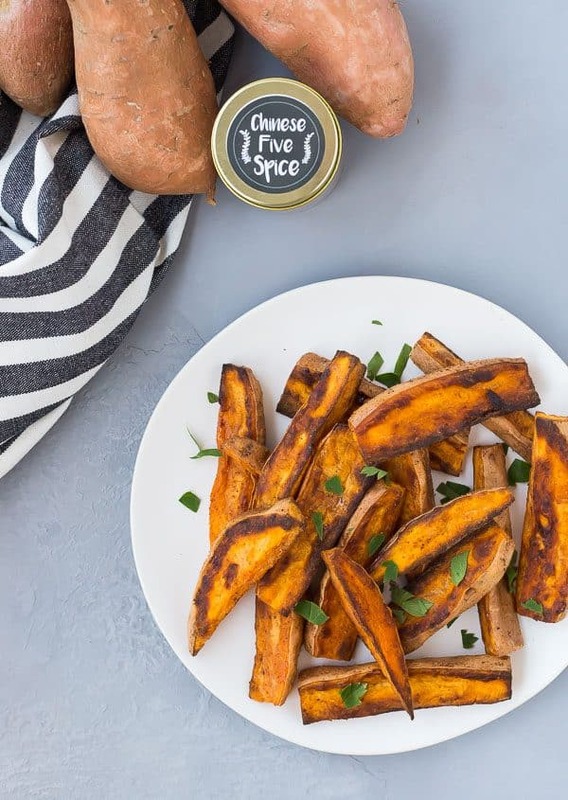 These Sweet Potato Wedges with Chinese Five Spice will become your new favorite way to eat sweet potatoes. They’re easy to make (baked, not fried!) and they’re completely irresistible…you won’t be able to stop eating them! 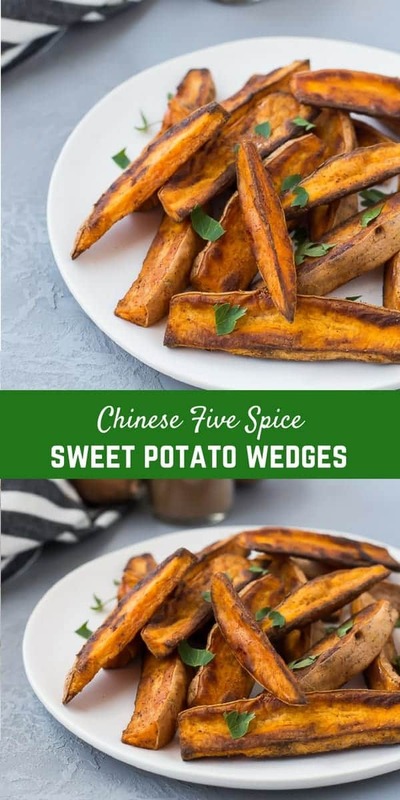 Sweet potato wedges with Chinese Five Spice. Reading that, are you skeptical? 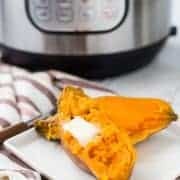 Do you think this recipe is too “weird?” From the second I tasted one of these (I was a little skeptical, too! ), they landed a permanent spot in my recipe rotation. And be warned, they’re addicting. I made them on an afternoon when my parents were coming over later to babysit, and when my mom got there I went through all the random stuff in the fridge that her and my dad could eat for dinner. It’s always interesting what ends up in there on a recipe testing day but I know they’re adventurous eaters and will try anything. I pointed out what was left of the sweet potato wedges (I couldn’t stop eating them earlier in the day! ), along with all the other stuff available to them. I was equal parts happy and annoyed when I got home and they were all gone. Mostly happy because I love when my mom tries my recipes and even happier when she likes them. Plus she said E loved them and I swear that girl gets pickier every day so that’s a total win, too. I was just a teensy bit annoyed (and not at my mom because I told her to eat them!) because it meant no late-night Whole30 compliant snack for me. I mean snacks aren’t technically Whole30 compliant anyways but I also had wine that night so I wasn’t really aiming for perfection. And yes, I’ve cheated once or twice during this Whole30. It’s my second one so I’m giving myself a little more grace. I’m still feeling amazing and getting great results. I had wine that night (it was free!) and I’ve had two bites of gluten-containing foods because I was developing recipes for you guys. But that’s it! I can’t in good conscience put a recipe up here just on Ben’s word that, “Yeah, it’s good.” Call me a control-freak, but it’s important to me that these recipes are winners for you guys! 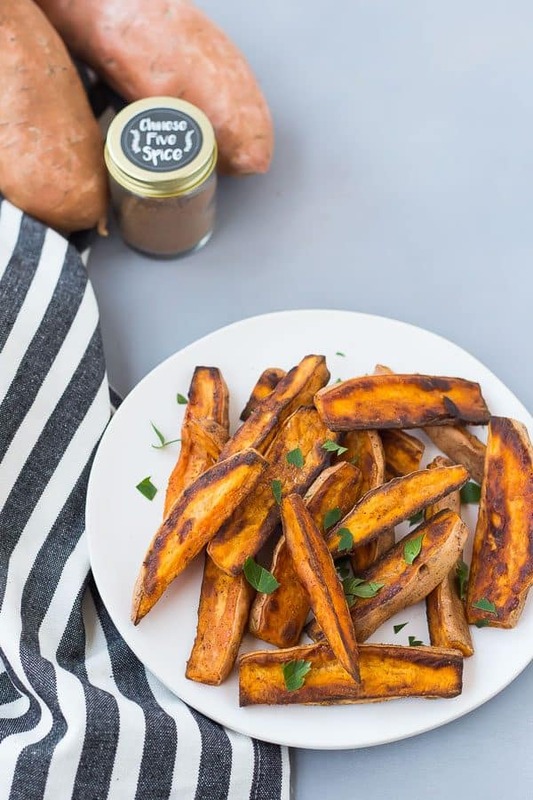 Let’s circle back around to these sweet potato wedges. I was inspired by a recipe in Cooking Light (I think) and also by Chinese Five Spice French Fries I had in the Atlanta airport with Julie of The Little Kitchen. She said they were a must-try, so I tried, and she was right. SO RIGHT. 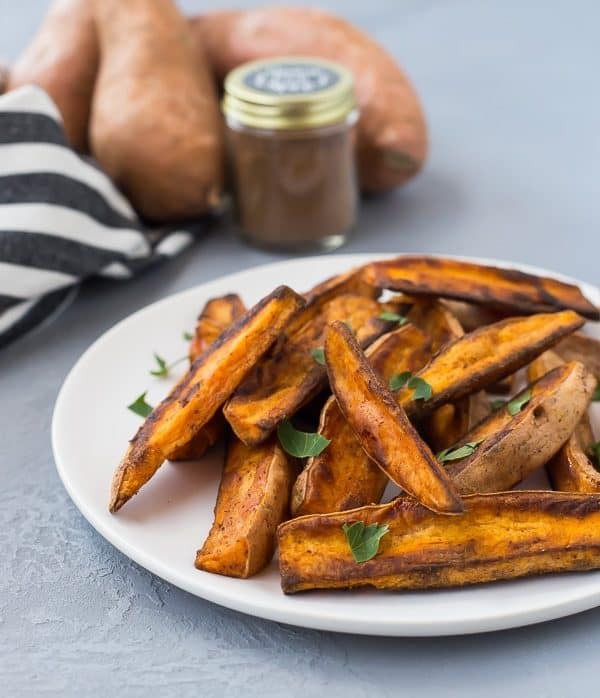 The spices in five spice go so well with the sweet flavor of the sweet potatoes. Wondering what the five spices are? Most commonly, they’re star anise, cloves, cinnamon, sichuan pepper, and fennel seeds. If you’re still not completely convinced, I beg you to try these and let me know what you think. 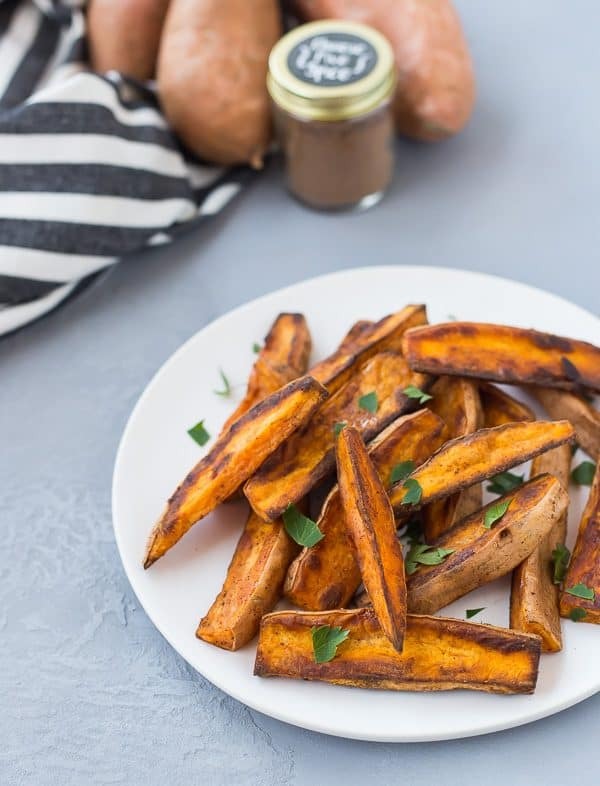 I just know you’re going to become the biggest fan of these sweet potato wedges. I’m making them again, stat. Maybe today. They’re cooked at a high heat so they’re perfectly crispy on the outside but silky smooth and soft on the inside. They’re salty and the combination of spices in the five spice powder just make your mouth so dang happy! I can’t get over these, you guys. I’m in love. 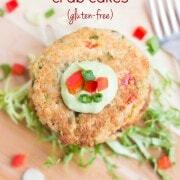 Oh and PS: They’re paleo and Whole30 compliant. If you don’t follow a specific diet, they’re still a healthy snack that’s oh-so-satisfying. 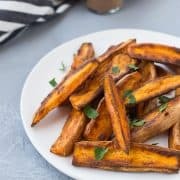 How do you make sweet potato wedges? Let’s avoid chopping off any fingers. Use a sharp knife, but be careful. You can peel your sweet potatoes but I like to scrub them well and leave the peeling on. You can cut the ends off or leave them on if they look okay. To cut a potato into wedges, first cut it down the middle lengthwise. This will give you a nice flat surface so it’s not rolling everywhere. From there, cut in at an angle (diagonally towards center), starting closest to the cutting board. That’s it! I got 10-12 wedges per potato but you could get more or less depending on how thin/thick you cut them and how large your potatoes are. Please please please make these and let me know what you think! Foil – I’m a big fan of these parchment paper sheets for roasting vegetables but since this recipe cooks at 450°F, it’s better to use foil since the parchment may burn at that temperature. Gluten Free Crackers – made with sweet potatoes! Preheat oven to 450ºF. Line a baking sheet with foil. In a large bowl (go big! 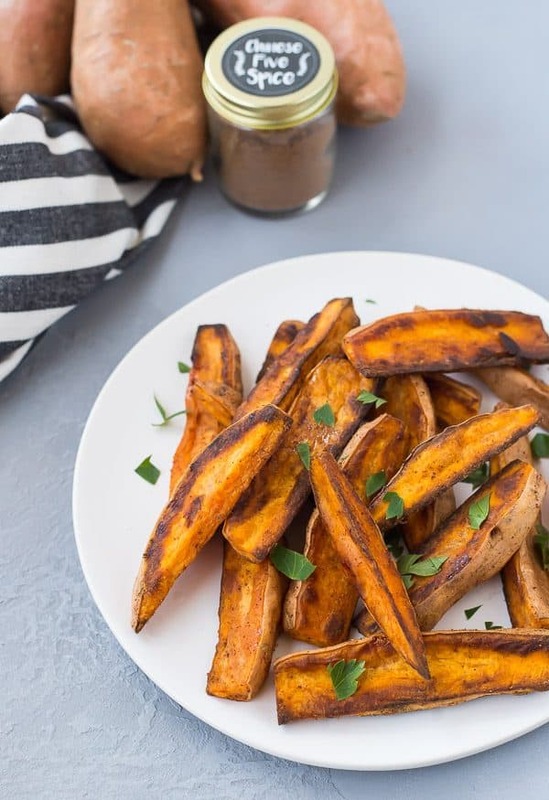 ), toss sweet potato wedges with coconut oil, five spice powder, salt, and smoked paprika. 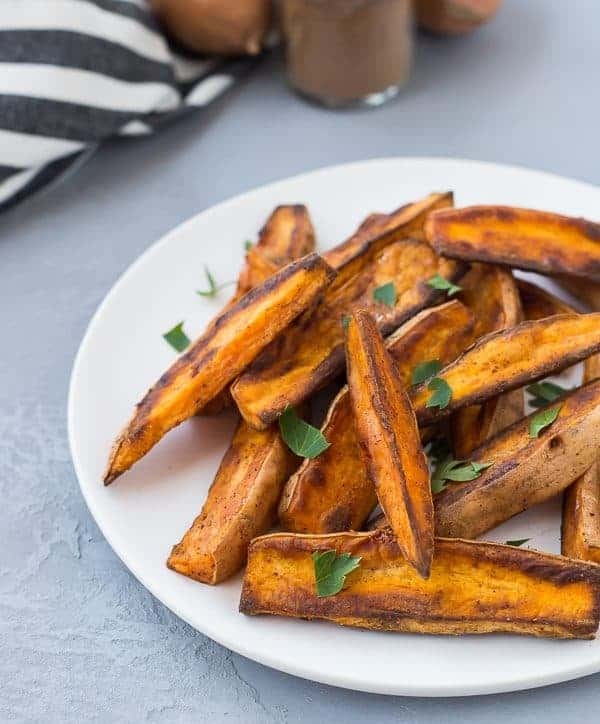 Place sweet potato wedges in a single layer on the prepared baking sheet. Bake for 30 minutes or until golden brown and crispy, flipping after 15 minutes. 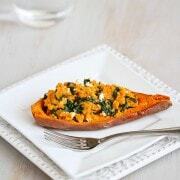 To cut sweet potatoes into wedges, first cut sweet potato in half lengthwise. Cut each half into wedges by cutting into the center diagonally. Cut each potato into 10-12 wedges. You may peel them or scrub them well if you like the peelings on. I set the serving size at approximately a half of a sweet potato for a total of six servings, but, umm…yeah….good luck with that. They’re irresistible. Husband’s take: I’m not sure if I gave Ben the opportunity to try these…whoops. Changes I would make: I’m making MORE next time! These were super good. I had to restrain myself to not eat them all without sharing them with E and dad. Sorry we polished them off.